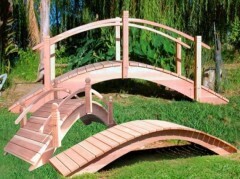 Add a whole new dimension to the look of your landscape with the new High Arch Series bridge. The High Arch will enhance the beauty of anything around it. When you need the clearance of about 24 inches from under the center support beams. Made by "Old World Craftsman" 100% Redwood. All galvanized fittings, easy assembly, custom sizes. Our bridges are completely fish safe, we do not use pressure-treated wood in our construction which makes these redwood bridges perfect for Koi Ponds or any of your landscaping needs Redwood Garden Bridges from California Custom built for your pond, creek, or Yard. Top Quality and Workmanship. All size options can be modified just for YOU!